File with fully backward compatible corrections. A file update is not required. File with fully backward compatible extensions or new features. A file update is recommended. File with incompatible modifications. A file update is required. Icons of parent groups also show that a difference exists. Refer to File, Group, and Component Attributes for the description. Both Update Config File ... options of the context menu will replace the existing file with the new file instantly and create a back-up file (extension *.NNNN) in the project directory to preserve your settings (NNNN is a sequential number). The new file must be updated with the values saved in the back-up file. You can set the values manually in the new file, or use a merge tool to compare and copy the values. 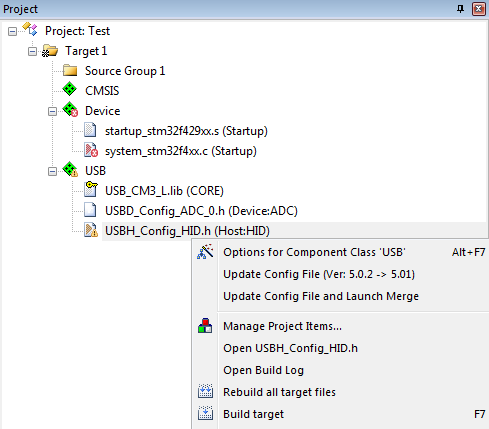 Refer to Configure Merge Tool to setup the utility. Update Config File (Ver. x -> y) copies the new version of the configuration file. Update Config File and Launch Merge copies the new version of the configuration file and opens the merge tool (if configured as described in Configure Merge Tool). The dialog Select Software Packs for Target might have an impact on the file version.